Our e-Learning courses are tailored to the needs of the client. The clients find our projects to be cost-effective and strategic for their use. We do not compromise on the quality of our projects. We work with Subject Matter Experts (SMEs), to ensure exactly that. Working with SMEs enables us to acquire more knowledge on the field that we are working on to create the project. So it is safe to say that we now have our flags pinned in almost all technology related fields including educational sector, training sector, gaming sector and entertainment sector. Known for their anytime access, the Mobile Applications give you more credibility and compatibility in the current market. 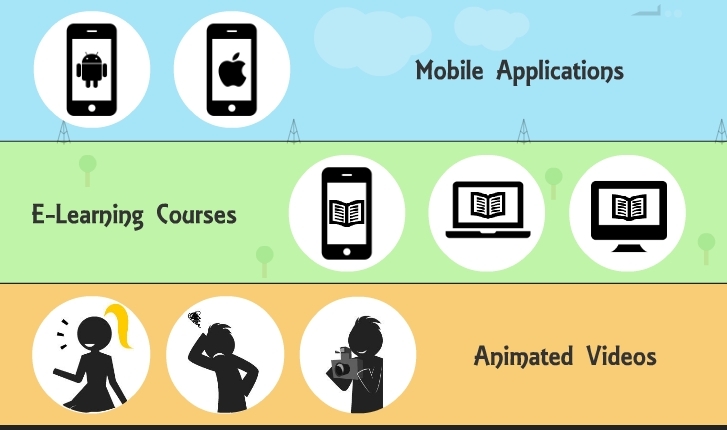 Mobile applications are of three types: Gaming, education and Management. We will create you your Mobile Application according to your enterprise and in a way the meets your needs. We create mobile applications in all the platforms like Android, iOS, Windows, Blackberry, etc. At Dynamic Pixel, we make 2D and 3D animations that are attractive, entertaining and informative. We make animated videos for the causes like advertisements, tutorials, publicising, etc. The animations made at Dynamic Pixel are unique and up to the standard. We use updated softwares and ultimate creativity to make our animations.